Chicago Bicycle Accident Lawyer | Illinois Bicycle Lawyers at Keating Law Offices: Could More Chicago Bike Cops Reduce the Number of Bike Accidents? Could More Chicago Bike Cops Reduce the Number of Bike Accidents? The Chicago Police Department has made it no secret that they intend to increase the number of police officers assigned to bike patrols. In an urban setting, bicycles make sense for police officers for the same reasons they make sense for commuters. Bikes are mobile, quick, and give people access to areas where motor vehicles are either prohibited or impractical. In the aftermath of the NATO Summit where bike patrols played a key role in containing demonstrators, the police department has increased training of new officers for bike patrol units. Increasing the number of two-wheeled patrol units can have a direct impact on the perception of safety in a community. As reported in the Chicago Tribune, a bike patrol unit arrested a juvenile carrying a firearm while on the Lakefront Path. Bike patrol units means that more eyes are on the ground, making interactions with others in the community more immediate. This sort of interaction can also translate to indirect safety benefits for other cyclists. Bike patrol units are unique in that they are bestowed the same power to enforce laws but are placed in a more vulnerable position when compared to riding in a patrol car. This increased vulnerability could possibly make bike patrol units a powerful yet sympathetic ally with other cyclists. 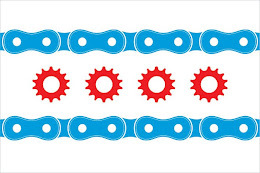 Chicago bike patrol units can be a key part of enacting meaningful changes Chicago's bicycling culture and how motorists and bicyclists alike view bicyclists. If you have any questions regarding this post or an issue involving a bicycle accident or Illinois personal injury law, please contact Illinois Bicycle Attorney Mike Keating at 312-208-7702 or MKeating@KeatingLegal.com 24 hours a day, 7 days a week. All e-mails and phone calls are returned promptly. All initial consultations are always confidential and free.